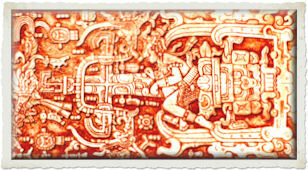 Is this an ancient depiction of an alien in a mobility scooter? 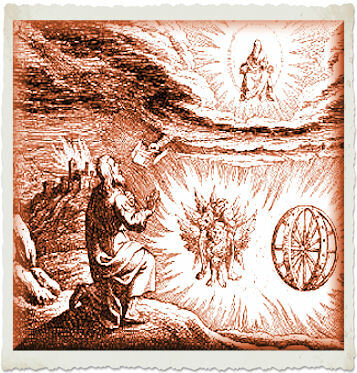 Is the Bible story of Ezeckial really about an alien in a mobility scooter? 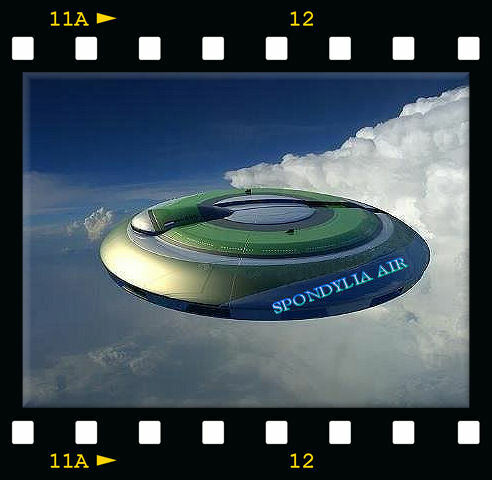 6,000 years ago, did an alien race known as the Spondylutians arrive on Earth from their home planet of Spondylia? Seeing how fragile humans were, did they decide to use their advanced scientific knowledge to make it so that the bones of humans didn't break quite so easily and would heal almost immediately if they did break? Did overlooking 'The Methane Factor" have horrible and tragic consequences for Mankind? Instead of strengthening the bones of humans, did the Spondylutians actually give the world SPONDYLITIS?! Newly discovered scrolls, left in a cave near the Dead Sea, say that even with their brilliant scientific knowledge, the Spondylutians were only able to partially fix their mistake and lessen the effects, so that everyone didn't get the disease that came to be known as Spondylitis. But the genie was out of the bottle, and some people would never be cured and would pass the Spondylitis down to their progeny. Despairing over having loosed a serious disease onto Mankind, the remorseful Spondylutians left, unfortunately, not remembering that they were taking a rather large sampling of Methane back with them, the container of which was broken while making their way through a bumpy asteroid belt, and now nearly half the folks back on Spondylia have Spondylitis too. The Spondylutian version of Spondylitis is so bad, most of the Spondy Spondylutians have to resort to using mobility scooters. Which begs the question, "Have we been visited by Aliens in mobility scooters? And what the heck do they want to do to us now?! But don't take my word for it. Here's proof. Below is an actual photograph of a Spondylutian spaceship on it's way to visit a drugstore here on Earth. "The truth is out there and it's even weirder than you think."